© 1915 by Margaret Rowe Clifford, currently held by the State of Arizona. This song, titled Arizona, was written in 1915 by Margaret Rowe Clifford (1841-1926) and published by the Hatch Music Company in Philadelphia, Pennsylvania. Born in Quebec, Canada, Mrs. Clifford move to Arizona in 1896. She was a teacher and was known for her poetry, published in a number of the local papers of Cochise County. The music is attributed to Maurice Blumenthal ( -1955). Mr. Blumenthal was an attorney and an amateur entertainer. Presumably, he knew something about music. "Arizona's State Anthem," as it was designated, was adopted by the Fourth Arizona State Legislature and became law on February 28, 1919 without Governor Thomas Campbell's signature. The act, adopting this song, required that all schools, public institutions, and the Battleship Arizona be furnished with copies by the Commission of State Institutions. As we researched the adoption of Arizona's official state anthem, we came across a discrepancy. The correct title of the song is in question. 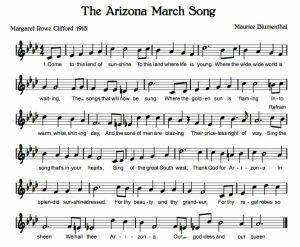 Today, the song is most often referred to as the "Arizona March Song." On the other hand, as can be seen below, the song adopted with the approval of House Bill No. 15 is clearly titled "Arizona." 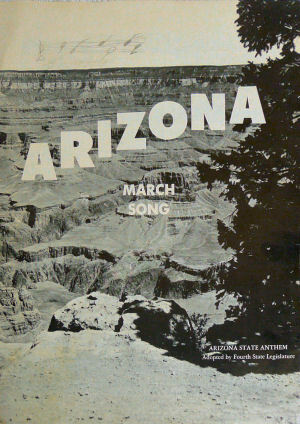 Sheet music often includes "March Song" with "Arizona" but is usually conveyed in a contrasting type face leading us to believe that "March Song" is a song descriptor and not part of the title. The entry in the 1915 Catalog of Copyright Entries, Part 3: Musical Compositions lists the song as "Arizona; march song." Other musical composition entries contained in the Catalog contain similarly formed entries. It seems to us that "march song" is either a compositional descriptor or part of the song title. We have contacted the United State Copyright Office for clarification. Currently, we are betting that "march song" is not part of the title. What do you think? You may purchase the sheet music from the Arizona Capitol Museum here. Contact the Arizona Capitol Museum at 602-926-3666 for further information. Arizona's alternate state anthem, adopted in 1982, is also titled Arizona. Or, is it I Love Arizona? Mercer, Preston. "Desert Scrapbook." Yuma Daily Sun 31 Jul 1953, Part 2, Page 2. Print. "Author State Song Passes January 20." Casa Grande Dispatch 29 Jan 1926, 4. Print. "Chapter 28." Acts, Resolutions and Memorials of the Regular Session Fourth Session of the State of Arizona . Tucson: Acme Publishing Company, 1919. 26-28. Print. About the State Songs : Arizona Secretary of State Kid's Page (SOS For Kids). Arizona Anthems: Office of the Arizona Secretary of State. More symbols & emblems: Complete list of official Arizona state symbols from NETSTATE.COM. State Songs: Anthems and Their Origins is a tremendous resource, from which readers will gain insight into the heritage of American statehood. Histories of these songs, biographical information about the composers and lyricists, and background on each song's entrance into status as "official" make this source the most comprehensive in existence. The entries include sheet music, allowing readers to reproduce for themselves the tunes that have proved so important in the history of the Union. Music teachers, history teachers, librarians, and anyone else interested in learning more about the United States will not want to be without State Songs. Organized alphabetically by state. Keep in mind that this book was published in 2000 and does not contain later adoptions.